I love to bake. I love to cook. There are few things in life I enjoy more than being in the kitchen. With a cup of coffee or glass of wine in hand and some Sinatra on the Sonos, creating something to enjoy with the ones I love around our family table truly feeds my soul. And while I’ve mastered the art of squeezing a layer cake or a multi-course meal out in a very cramped amount of time, something I haven’t seemed to master is always having the right ingredients on hand. Sure, I almost always have the essentials; eggs, milk, butter, flour, sugar, etc., but the little, lesser known players like buttermilk and cake flour sometimes slip under the radar. As a result of this, I have become an expert in culinary substitutions. I grew up watching my mom swap the occasional applesauce for vegetable oil, but did you know that you can make cake flour by simply adding the right amount of corn starch to regular, self-rising flour? For buttermilk, you can actually add a bit of vinegar to regular milk or use plain old yogurt instead. Needless to say, in all of my unpreparedness earnest, I’ve learned how to cut a lot of corners. As long as you get the ratios right (if any of my students are reading this, pay attention to your fractions! ), there is always a way to make it work. I like to consider these concoctions my own adventures in chemistry, seeing as though that was the one lab science I managed to avoid my entire academic career! Yesterday, though, I ventured into some unknown territory . . . a land in which I had to make frosting without any confectioners (powdered) sugar. I thought about making a simple glaze, but that idea was quickly thwarted when I realized that glaze, too, requires the powdered goodness. So, I called in the big guns: Google. With a little digging I was able to find a recipe for icing that called for three simple ingredients: eggs yolks, sweetened condensed milk, and butter. Some of you may find it interesting that I had sweetened condensed milk in the pantry and not powdered sugar but items of the canned variety usually last longer than anything else in my house. While on the subject of frosting and icing, did you know that there is actually a categorical difference between the two? I always thought that which term you used was based on geography, like soda vs. pop (soda), sneakers vs. tennis shoes (sneakers), but ohhhhhhh no, my friends. According to my Williams Sonoma cookbook, frosting and icing are two distinctively different finishing touches. In case you were wondering, frosting is of a thicker consistency used to coat the outside of a cake while icing is generally thinner and more sugary in nature. After reading this it occurred to me that icing sounds a whole lot like a glaze, but the book had a separate bio for that accoutrement as well. And we all know there is no arguing with Williams Sonoma. Anyhow, since I was set on making my absolute favorite yellow butter cake, I decided to try this modified icing recipe since I could easily throw some fresh lemon zest and juice in there to keep the dessert light and summertime fresh. 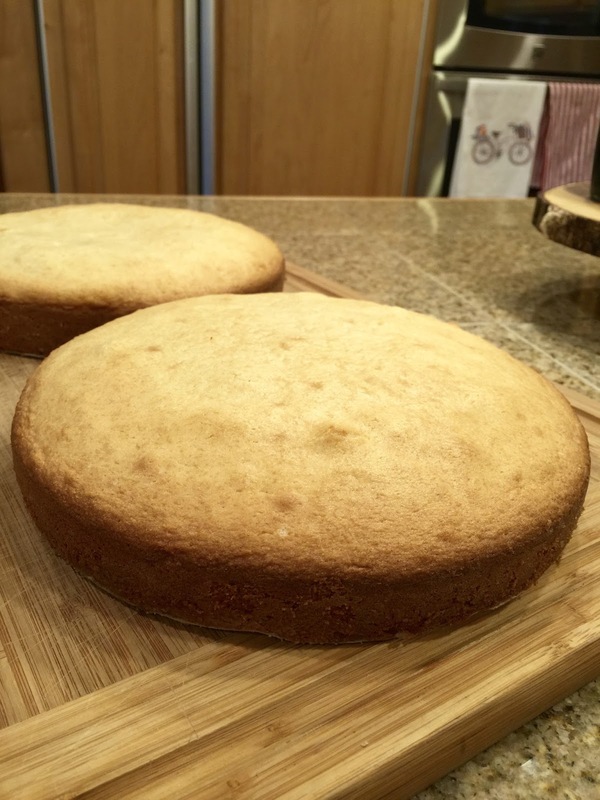 For any of you who have not tried this particular butter cake recipe, I highly recommend it. Its very easy to make and absolutely fool proof. I’ve modified it for pound cakes, cupcakes, etc., and it has never let me down. This is also probably a good time for me to confess my undying devotion to my neighbor (and by neighbor I mean her estate farm heaven house is about 15 minutes away) and Domestic Queen Martha Stewart and warn you that many of my future food posts may be laden with her recipes or tricks of the trade. Much to my father’s chagrin (he still can’t seem to get past her stint in the Slammer), I am a Martha (and fellow GWU alumna, Ina Garten, for that matter) diehard. But, I digress. As a general rule of thumb, every time I try a new recipe I follow it exactly and then tend to modify or make changes as I see fit in the future. I try not to assume that I always have a better idea. So I whisked away over the flame as directed and did not add my lemon zest (about 2 lemons worth) or lemon juice (about 1 full lemon’s worth) until the icing was slightly cool. I should add that it is super important to let the cakes cool completely before you attempt to frost, ice, or glaze anything. I pulled these guys out of the oven just as I was walking out the door to go to Mass and they were completely cool by the time we got home, so it takes a little over an hour. Definitely don’t want to rush that part of the process! The consistency of the icing was fair, but certainly too thick to glaze the way I would have liked it too. I would have heated it up a tick more but condensed milk plus butter is a recipe for evisceration so I decided to spread the icing all over so that it resembled a frosting. I probably could have added a bit of regular milk to thin it out a bit, but I just wasn’t in the mood. I did add a layer that had cooled more in between the cakes and it had a yummy fresh (almost) lemon curd feel to it. In truth, it tasted delicious; just sweet enough with the right amount of freshness from the lemon. A sprinkling of freshly toasted coconut would have been heavenly, but we will have to save that for another day. I simply want to tell you that I’m newbie to blogging and actually loved this web blog. Most likely I’m planning to bookmark your website . You absolutely have exceptional articles. Regards for revealing your webpage. Hi, Neat post. There is an issue with your site in web explorer, might test this… IE nonetheless is the market leader and a huge component of other people will pass over your great writing because of this problem. I’m extremely pleased to uncover this great site. I want to to thank you for ones time for this particularly fantastic read!! I definitely appreciated every bit of it and I have you saved as a favorite to check out new things in your site. Wow, amazing blog structure! How long have you been running a blog for? you made running a blog glance easy. The entire glance of your site is wonderful, let alone the content! Good ¡V I should certainly pronounce, impressed with your site. I had no trouble navigating through all the tabs and related information ended up being truly simple to do to access. I recently found what I hoped for before you know it at all. Reasonably unusual. Is likely to appreciate it for those who add forums or anything, site theme . a tones way for your customer to communicate. Excellent task..
Heya there, just started to be familiar with your blog page through Search engines like google, and realized that it is genuinely useful. I’ll value should you carry on such. I’ve read some good stuff here. Definitely worth bookmarking for revisiting. I wonder how much attempt you set to make any such wonderful informative website. Thanks, I’ve recently been looking for information about this topic for ages and yours is the greatest I have found out so far. But, what about the bottom line? Are you sure in regards to the source? You could definitely see your skills in the paintings you write. The world hopes for more passionate writers like you who are not afraid to mention how they believe. All the time go after your heart. “A second wife is hateful to the children of the first a viper is not more hateful.” by Euripides. An outstanding share! I’ve just forwarded this onto a friend who had been conducting a little homework on this. And he actually bought me dinner because I discovered it for him… lol. So allow me to reword this…. Thanks for the meal!! But yeah, thanks for spending time to talk about this subject here on your website. Hello my family member! I want to say that this post is amazing, nice written and come with approximately all important infos. I would like to see extra posts like this. I have read some excellent stuff here. Definitely worth bookmarking for revisiting. I surprise how a lot attempt you place to make the sort of excellent informative site. I carry on listening to the news bulletin speak about getting free online grant applications so I have been looking around for the finest site to get one. Could you advise me please, where could i get some? Hello.This post was really fascinating, particularly because I was looking for thoughts on this topic last Tuesday. Merely wanna remark that you have a very nice website , I like the design it really stands out. Excellent site. Lots of helpful info here. I am sending it to a few friends ans also sharing in delicious. And certainly, thanks in your sweat! Well I sincerely enjoyed reading it. This subject provided by you is very constructive for accurate planning. Needed to send you this little note to finally give thanks once again on your pretty guidelines you have contributed on this site. It has been simply strangely generous of people like you to give unhampered just what most of us might have offered for an e book to help with making some dough on their own, precisely now that you could have done it in case you wanted. Those tips likewise served to become a fantastic way to recognize that the rest have a similar zeal just as my personal own to see lots more on the topic of this problem. I think there are numerous more pleasurable opportunities ahead for people who scan your blog post. Hi my loved one! I wish to say that this article is amazing, nice written and come with approximately all important infos. I¡¦d like to look more posts like this . Just wanna comment that you have a very decent web site , I like the design and style it really stands out. Its good as your other content : D, appreciate it for putting up. “Always be nice to people on the way up because you’ll meet the same people on the way down.” by Wilson Mizner. Great – I should certainly pronounce, impressed with your site. I had no trouble navigating through all the tabs as well as related info ended up being truly easy to do to access. I recently found what I hoped for before you know it in the least. Quite unusual. Is likely to appreciate it for those who add forums or something, website theme . a tones way for your client to communicate. Nice task. It is in reality a great and useful piece of information. I am satisfied that you just shared this useful information with us. Please stay us informed like this. Thank you for sharing. What i do not understood is actually how you are now not really a lot more well-favored than you might be right now. You’re very intelligent. You realize thus significantly when it comes to this subject, produced me in my view consider it from a lot of numerous angles. Its like men and women aren’t fascinated except it is one thing to do with Lady gaga! Your personal stuffs excellent. At all times handle it up! Thank you, I’ve recently been searching for information about this topic for ages and yours is the best I’ve found out so far. But, what in regards to the bottom line? Are you positive about the source? You have observed very interesting details ! ps nice web site . “The appearance of right oft leads us wrong.” by Horace. I have to voice my passion for your kindness for people who have the need for guidance on this important study. Your very own commitment to getting the solution all-around turned out to be especially invaluable and has continually made associates just like me to realize their ambitions. Your own warm and helpful facts means a lot to me and extremely more to my peers. Thanks a ton; from everyone of us. of course like your web-site but you need to test the spelling on quite a few of your posts. A number of them are rife with spelling issues and I find it very bothersome to tell the reality nevertheless I¡¦ll certainly come back again. Well I definitely enjoyed reading it. This post procured by you is very helpful for accurate planning. You actually make it appear so easy with your presentation but I to find this matter to be really something that I think I’d never understand. It kind of feels too complicated and very large for me. I am looking ahead in your next put up, I¡¦ll try to get the hang of it! Thank you for any other informative web site. The place else could I am getting that type of information written in such a perfect method? I have a project that I’m simply now working on, and I have been on the glance out for such info. I have been browsing online more than 3 hours today, but I by no means discovered any interesting article like yours. It is beautiful price sufficient for me. Personally, if all webmasters and bloggers made just right content material as you probably did, the net will be a lot more useful than ever before. Usually I don’t read article on blogs, but I would like to say that this write-up very compelled me to try and do so! Your writing style has been amazed me. Thanks, very nice post. It’s appropriate time to make some plans for the future and it’s time to be happy. I’ve read this post and if I could I wish to suggest you some interesting things or tips. Perhaps you can write next articles referring to this article. I wish to read even more things about it! I will immediately grab your rss feed as I can not in finding your e-mail subscription link or e-newsletter service. Do you have any? Kindly let me recognize in order that I may subscribe. Thanks. I have been exploring for a little for any high quality articles or blog posts on this sort of area . Exploring in Yahoo I eventually stumbled upon this website. Reading this info So i am satisfied to exhibit that I have an incredibly good uncanny feeling I discovered just what I needed. I such a lot indisputably will make certain to don¡¦t fail to remember this web site and give it a glance on a relentless basis. I just wanted to make a simple message to thank you for the fantastic instructions you are placing at this site. My extended internet lookup has at the end of the day been rewarded with good quality details to talk about with my pals. I would suppose that we site visitors actually are undoubtedly lucky to live in a very good network with many special people with very beneficial solutions. I feel extremely lucky to have seen the website page and look forward to many more pleasurable minutes reading here. Thanks a lot once more for all the details. Thank you for some other informative blog. The place else may just I get that type of information written in such an ideal means? I’ve a project that I’m simply now working on, and I’ve been on the glance out for such info. Very well written story. It will be helpful to anyone who employess it, as well as myself. Keep up the good work – looking forward to more posts. Useful info. Fortunate me I found your website by accident, and I’m shocked why this coincidence did not took place earlier! I bookmarked it. fantastic publish, very informative. I’m wondering why the other experts of this sector don’t realize this. You must proceed your writing. I am confident, you’ve a great readers’ base already! I would like to thank you for the efforts you’ve put in writing this website. I’m hoping the same high-grade site post from you in the upcoming also. Actually your creative writing abilities has encouraged me to get my own blog now. Really the blogging is spreading its wings rapidly. Your write up is a good example of it. I’m commenting to let you know of the superb experience our princess found viewing your web page. She came to understand some issues, with the inclusion of how it is like to have a very effective teaching character to let many more smoothly comprehend specified very confusing subject matter. You really exceeded our own expected results. Thanks for churning out those insightful, trustworthy, informative as well as easy tips on the topic to Gloria. I just wanted to compose a small word to be able to express gratitude to you for all of the precious tips and hints you are posting on this site. My extensive internet lookup has at the end of the day been honored with high-quality details to talk about with my family and friends. I ‘d say that most of us readers are very lucky to dwell in a wonderful website with very many special professionals with insightful hints. I feel really privileged to have seen your entire web pages and look forward to so many more excellent moments reading here. Thank you once more for a lot of things. Thanks for every other excellent post. Where else may just anyone get that kind of info in such a perfect means of writing? I’ve a presentation subsequent week, and I’m on the look for such information. I in addition to my buddies were found to be reading through the good things from your web blog and so quickly I got a terrible feeling I never expressed respect to the web site owner for those strategies. Those men appeared to be as a consequence glad to read them and have in fact been taking pleasure in them. I appreciate you for getting very considerate as well as for finding this form of cool themes millions of individuals are really desirous to understand about. Our own honest apologies for not expressing gratitude to earlier. I precisely needed to say thanks once again. I am not sure the things that I could possibly have tried without the aspects shown by you regarding that problem. It had been the distressing situation in my circumstances, however , seeing the very professional manner you dealt with the issue forced me to cry over fulfillment. Now i’m grateful for the work and even expect you know what a great job you are always doing training the rest all through your web site. Most probably you haven’t come across any of us. Hello.This post was extremely motivating, particularly since I was browsing for thoughts on this issue last Tuesday. Hello very cool website!! Man .. Excellent .. Amazing .. I will bookmark your website and take the feeds additionally¡KI am glad to find a lot of useful info here in the put up, we need develop extra strategies in this regard, thank you for sharing. . . . . .
Wow, marvelous blog structure! How lengthy have you ever been blogging for? you make running a blog look easy. The overall glance of your site is magnificent, let alone the content! Usually I don’t read article on blogs, however I would like to say that this write-up very compelled me to take a look at and do so! Your writing style has been amazed me. Thanks, very nice article. Somebody essentially help to make critically articles I might state. This is the first time I frequented your web page and to this point? I surprised with the research you made to make this particular post amazing. Great task! It¡¦s actually a nice and helpful piece of info. I¡¦m glad that you simply shared this helpful information with us. Please keep us informed like this. Thank you for sharing. I’m still learning from you, but I’m improving myself. I certainly liked reading everything that is posted on your website.Keep the stories coming. I liked it! You really make it seem really easy along with your presentation but I to find this matter to be actually one thing that I feel I might by no means understand. It seems too complex and extremely wide for me. I’m looking ahead on your subsequent put up, I will attempt to get the hang of it! I am also writing to make you be aware of what a notable experience our princess had going through your web site. She mastered several things, which included what it’s like to have an excellent coaching mood to get many more with no trouble fully understand various complex matters. You undoubtedly did more than readers’ desires. I appreciate you for supplying the warm and helpful, safe, informative and unique thoughts on your topic to Julie. Thanks for every one of your hard work on this blog. My mum really loves conducting research and it’s really easy to see why. We all hear all regarding the compelling medium you render insightful items on the web site and improve contribution from other individuals on that article plus my girl has always been being taught so much. Take pleasure in the rest of the year. You’re the one carrying out a useful job. I wanted to post you that very small observation to finally say thanks yet again with your wonderful guidelines you have featured on this website. It was quite wonderfully generous with you to allow without restraint just what a number of people could possibly have sold for an e book to help with making some dough for themselves, notably considering the fact that you might have tried it in case you desired. The suggestions as well worked to be a good way to understand that other people online have the identical eagerness much like my personal own to realize significantly more concerning this matter. I’m sure there are millions of more enjoyable times in the future for people who start reading your blog post. Great awesome things here. I¡¦m very satisfied to see your post. Thanks so much and i’m taking a look ahead to touch you. Will you kindly drop me a mail? Hello there, I discovered your site by way of Google while looking for a comparable topic, your web site got here up, it appears to be like great. I’ve bookmarked it in my google bookmarks. Very well written article. It will be beneficial to everyone who utilizes it, including yours truly :). Keep doing what you are doing – can’r wait to read more posts. I intended to put you the bit of observation to finally give many thanks as before regarding the marvelous guidelines you’ve provided on this website. It has been really pretty open-handed of people like you to grant unreservedly what exactly a number of us could have distributed as an e book to get some bucks for their own end, chiefly considering the fact that you might have done it if you decided. Those solutions also served to be the great way to realize that other people have similar passion really like my personal own to grasp a lot more with regard to this condition. I am sure there are lots of more pleasant periods up front for those who go through your blog post. Hi folks here, just got conscious of your website through Yahoo and bing, and found that it is truly informational. I’ll value if you decide to maintain this approach. wonderful submit, very informative. I’m wondering why the other specialists of this sector don’t understand this. You should proceed your writing. I’m sure, you’ve a huge readers’ base already! Somebody necessarily assist to make severely articles I might state. That is the first time I frequented your web page and up to now? I amazed with the research you made to make this particular publish extraordinary. Magnificent activity! F*ckin’ amazing issues here. I am very glad to see your article. Thanks so much and i’m having a look forward to touch you. Will you kindly drop me a e-mail? I like this web site very much, Its a rattling nice position to read and find info . “A little in one’s own pocket is better than much in another man’s purse.” by Miguel de Cervantes. I am only commenting to make you be aware of of the fabulous experience my friend’s girl went through studying the blog. She realized such a lot of pieces, which include what it is like to have an amazing coaching style to get a number of people with no trouble thoroughly grasp selected tortuous subject matter. You undoubtedly did more than my expected results. Thank you for providing those warm and friendly, safe, edifying and unique tips on the topic to Janet. I intended to draft you a very small word so as to say thanks a lot again on the breathtaking methods you have contributed on this site. It was simply remarkably generous with people like you to give publicly all that a number of us would have distributed for an e book to make some profit for their own end, notably considering that you might well have tried it in case you considered necessary. The guidelines in addition served to become great way to fully grasp that most people have a similar dreams much like my personal own to understand somewhat more around this matter. I am sure there are a lot more pleasurable situations up front for folks who browse through your blog post. Thank you for all your hard work on this web page. Kim really loves managing investigation and it is easy to see why. All of us notice all relating to the dynamic mode you provide simple information via this web blog and in addition increase participation from people on that article then our own princess is in fact studying a lot. Have fun with the remaining portion of the year. You’re the one carrying out a first class job. You can definitely see your skills within the work you write. The sector hopes for more passionate writers such as you who are not afraid to mention how they believe. All the time follow your heart. “He never is alone that is accompanied with noble thoughts.” by Fletcher. You really make it appear really easy together with your presentation but I to find this topic to be really one thing which I believe I would never understand. It sort of feels too complex and very vast for me. I am taking a look forward to your subsequent post, I¡¦ll try to get the cling of it! I just wanted to compose a small message so as to say thanks to you for all the remarkable information you are writing here. My extended internet look up has finally been recognized with brilliant facts to go over with my friends and classmates. I would suppose that most of us site visitors are rather lucky to live in a fantastic website with so many outstanding people with great plans. I feel pretty fortunate to have used your entire webpages and look forward to really more amazing minutes reading here. Thank you once more for a lot of things. I will immediately grasp your rss feed as I can’t to find your email subscription hyperlink or newsletter service. Do you’ve any? Please allow me realize so that I could subscribe. Thanks. Hi, Neat post. There is an issue together with your web site in internet explorer, might test this… IE nonetheless is the marketplace leader and a large component of other folks will leave out your magnificent writing due to this problem. Some truly superb info , Sword lily I observed this. “A poem is never finished, only abandoned.” by Paul Valery. Good day very cool site!! Guy .. Excellent .. Wonderful .. I’ll bookmark your blog and take the feeds also…I am glad to find so many helpful info here within the submit, we need develop more techniques in this regard, thank you for sharing. I really enjoy reading through on this internet site , it has superb articles . “A man of genius has been seldom ruined but by himself.” by Samuel Johnson. Of course, what a great site and instructive posts, I definitely will bookmark your website.Best Regards! you are really a just right webmaster. The website loading speed is incredible. It sort of feels that you are doing any unique trick. Moreover, The contents are masterpiece. you have done a magnificent process in this matter! Thank you for sharing superb informations. Your website is very cool. I am impressed by the details that you’ve on this blog. It reveals how nicely you perceive this subject. Bookmarked this web page, will come back for more articles. You, my pal, ROCK! I found simply the information I already searched all over the place and simply couldn’t come across. What a perfect web site. Thanks for your entire effort on this web site. Betty loves conducting research and it is simple to grasp why. Many of us learn all concerning the dynamic ways you present helpful information via the web blog and therefore encourage participation from people on that concern and our princess is studying a lot. Have fun with the remaining portion of the new year. You’re the one carrying out a stunning job. hi!,I love your writing so so much! percentage we keep in touch extra about your article on AOL? I require a specialist in this space to unravel my problem. Maybe that is you! Looking forward to peer you. Magnificent site. Plenty of useful information here. I am sending it to some buddies ans also sharing in delicious. And obviously, thanks for your sweat! Hello my loved one! I want to say that this post is awesome, great written and come with almost all significant infos. I would like to see extra posts like this. You are my inhalation, I own few blogs and very sporadically run out from post :). “The soul that is within me no man can degrade.” by Frederick Douglas. [url=http://nutritioninpill.com/]http://nutritioninpill.com/[/url] Buy valium Coehoungaphype, How safe is Valium bought online? I do agree with all of the concepts you’ve offered to your post. They are very convincing and can certainly work. Nonetheless, the posts are too brief for newbies. May just you please extend them a little from next time? Thank you for the post. you are in point of fact a just right webmaster. The web site loading speed is incredible. It seems that you’re doing any distinctive trick. Also, The contents are masterpiece. you have done a fantastic activity in this topic! I simply wanted to write a small comment to thank you for all the stunning tips and tricks you are sharing at this website. My long internet lookup has at the end been paid with excellent tips to talk about with my friends. I ‘d suppose that many of us visitors are extremely endowed to be in a remarkable place with very many outstanding professionals with great tips. I feel truly grateful to have encountered the webpage and look forward to tons of more entertaining minutes reading here. Thanks a lot again for a lot of things. Great remarkable things here. I¡¦m very glad to see your post. Thanks a lot and i’m looking ahead to contact you. Will you kindly drop me a mail? I simply wanted to write down a quick remark to express gratitude to you for all the magnificent steps you are posting here. My rather long internet research has at the end of the day been recognized with useful knowledge to exchange with my relatives. I would believe that most of us site visitors actually are unquestionably endowed to exist in a useful place with so many outstanding individuals with beneficial basics. I feel pretty grateful to have discovered your web site and look forward to tons of more amazing minutes reading here. Thanks a lot once again for all the details. Wonderful goods from you, man. I’ve understand your stuff previous to and you’re just extremely wonderful. I actually like what you have acquired here, really like what you are saying and the way in which you say it. You make it enjoyable and you still take care of to keep it smart. I can’t wait to read far more from you. This is actually a terrific website. Thanks for sharing superb informations. Your web-site is so cool. I’m impressed by the details that you’ve on this blog. It reveals how nicely you understand this subject. Bookmarked this website page, will come back for more articles. You, my friend, ROCK! I found simply the info I already searched everywhere and simply could not come across. What a perfect web-site. It is the best time to make some plans for the future and it is time to be happy. I have read this post and if I could I desire to suggest you some interesting things or tips. Maybe you can write next articles referring to this article. I desire to read more things about it! I precisely had to say thanks yet again. I do not know the things I might have created without those points provided by you on such problem. It was actually a real intimidating issue in my view, but finding out your specialized strategy you processed the issue made me to weep for joy. I am just thankful for the work and thus hope you find out what an amazing job you have been doing teaching many others by way of a site. Probably you have never come across all of us. Just wish to say your article is as astounding. The clarity in your post is just spectacular and i could assume you are an expert on this subject. Fine with your permission let me to grab your RSS feed to keep up to date with forthcoming post. Thanks a million and please continue the enjoyable work. Thanks for all your hard work on this web page. Kate really loves setting aside time for internet research and it is simple to grasp why. Almost all learn all concerning the lively form you present sensible techniques by means of the web site and as well encourage participation from other ones about this concept and our own daughter has been becoming educated a lot. Have fun with the rest of the year. You’re carrying out a fantastic job. I was studying some of your articles on this internet site and I believe this web site is really instructive! Retain posting. Fantastic goods from you, man. I’ve understand your stuff previous to and you’re just too wonderful. I actually like what you’ve acquired here, really like what you are stating and the way in which you say it. You make it enjoyable and you still take care of to keep it wise. I cant wait to read much more from you. This is actually a terrific web site. I wanted to write you one very small remark in order to give many thanks as before considering the splendid guidelines you have featured on this page. It is really extremely open-handed with people like you in giving publicly what a lot of folks could possibly have made available for an e-book to make some dough on their own, mostly considering the fact that you could have tried it in case you considered necessary. Those secrets likewise served like the good way to be certain that other people have the same zeal much like my very own to see way more around this matter. Certainly there are a lot more enjoyable periods in the future for those who take a look at your website. Howdy! This article could not be written much better! Looking at this article reminds me of my previous roommate! He continually kept preaching about this. I most certainly will forward this information to him. Pretty sure he’s going to have a good read. Many thanks for sharing! Hello very nice web site!! Man .. Excellent .. Wonderful .. I’ll bookmark your website and take the feeds also…I am satisfied to find so many useful information here within the publish, we need work out extra techniques in this regard, thank you for sharing. Hiya! Quick question that’s totally off topic. Do you know how to make your site mobile friendly? My web site looks weird when browsing from my iphone 4. I’m trying to find a template or plugin that might be able to correct this issue. If you have any suggestions, please share. Thanks! Hi there! This post could not be written much better! Looking at this article reminds me of my previous roommate! He constantly kept preaching about this. I am going to send this post to him. Pretty sure he will have a great read. Thank you for sharing! I think this internet site contains some rattling good information for everyone :D. “As ill-luck would have it.” by Miguel de Cervantes. I have read some good stuff here. Certainly worth bookmarking for revisiting. I wonder how so much attempt you put to create such a fantastic informative site. you’re really a just right webmaster. The web site loading velocity is amazing. It kind of feels that you are doing any unique trick. Furthermore, The contents are masterpiece. you have performed a magnificent process in this topic! You are my aspiration , I own few web logs and rarely run out from to post .I believe this website contains some rattling superb info for everyone. “There is nothing so disagreeable, that a patient mind cannot find some solace for it.” by Lucius Annaeus Seneca. certainly like your website but you need to take a look at the spelling on several of your posts. Several of them are rife with spelling problems and I find it very troublesome to tell the reality nevertheless I will surely come back again. I¡¦ll right away seize your rss as I can’t to find your email subscription hyperlink or newsletter service. Do you’ve any? Please allow me recognise so that I could subscribe. Thanks. I’m still learning from you, while I’m trying to achieve my goals. I certainly enjoy reading all that is posted on your blog.Keep the posts coming. I loved it! I wish to show appreciation to you for bailing me out of this condition. Just after looking through the the net and seeing things which are not powerful, I figured my entire life was over. Living without the presence of solutions to the issues you have resolved by means of your main article is a critical case, as well as those which might have adversely affected my career if I had not discovered your web site. That talents and kindness in touching every part was helpful. I don’t know what I would have done if I hadn’t discovered such a subject like this. It’s possible to now look forward to my future. Thanks for your time so much for the skilled and sensible guide. I won’t be reluctant to propose your web page to anyone who desires counselling on this area. Hi there! Quick question that’s completely off topic. Do you know how to make your site mobile friendly? My website looks weird when viewing from my apple iphone. I’m trying to find a template or plugin that might be able to fix this issue. If you have any recommendations, please share. Appreciate it! Thank you, I have recently been searching for information approximately this topic for ages and yours is the best I have found out so far. But, what in regards to the bottom line? Are you sure about the supply? Great ¡V I should certainly pronounce, impressed with your web site. I had no trouble navigating through all the tabs as well as related information ended up being truly simple to do to access. I recently found what I hoped for before you know it in the least. Quite unusual. Is likely to appreciate it for those who add forums or anything, site theme . a tones way for your client to communicate. Nice task..
Howdy very cool web site!! Man .. Beautiful .. Amazing .. I will bookmark your website and take the feeds additionally¡KI am happy to search out so many helpful information here within the publish, we want develop more strategies on this regard, thanks for sharing. . . . . . I want to express my gratitude for your kindness giving support to folks that have the need for help on that area of interest. Your real dedication to passing the message all through turned out to be extremely productive and have consistently permitted most people much like me to realize their desired goals. Your amazing interesting recommendations indicates much a person like me and still more to my colleagues. Regards; from everyone of us. It is perfect time to make some plans for the future and it is time to be happy. I’ve read this post and if I could I desire to suggest you few interesting things or advice. Perhaps you could write next articles referring to this article. I want to read more things about it! You really make it appear so easy together with your presentation but I in finding this topic to be really one thing that I think I’d never understand. It seems too complicated and extremely broad for me. I’m looking ahead on your next submit, I will try to get the dangle of it! I was recommended this web site through my cousin. I am now not sure whether or not this put up is written by him as no one else recognise such detailed about my problem. You are incredible! Thank you! great issues altogether, you just won a new reader. What may you suggest in regards to your post that you made some days in the past? Any positive? I together with my guys have been going through the excellent tips and hints on the blog while all of a sudden came up with a horrible suspicion I never thanked you for those secrets. My boys are actually for that reason excited to study all of them and already have in truth been taking pleasure in them. Thank you for simply being so considerate as well as for figuring out varieties of outstanding areas millions of individuals are really eager to know about. My personal sincere regret for not saying thanks to sooner. naturally like your web site however you have to take a look at the spelling on quite a few of your posts. Several of them are rife with spelling issues and I find it very troublesome to tell the reality then again I¡¦ll surely come again again. After looking at a few of the blog articles on your site, I seriously appreciate your technique of writing a blog. I saved as a favorite it to my bookmark website list and will be checking back in the near future. Please check out my web site too and tell me your opinion. I absolutely love your blog and find a lot of your post’s to be just what I’m looking for. Would you offer guest writers to write content for you personally? I wouldn’t mind writing a post or elaborating on most of the subjects you write about here. Again, awesome website! An outstanding share! I have just forwarded this onto a coworker who had been doing a little homework on this. And he actually bought me lunch due to the fact that I discovered it for him… lol. So let me reword this…. Thanks for the meal!! But yeah, thanks for spending some time to discuss this matter here on your web page. An impressive share! I’ve just forwarded this onto a co-worker who was conducting a little research on this. And he in fact ordered me dinner due to the fact that I discovered it for him… lol. So let me reword this…. Thanks for the meal!! But yeah, thanx for spending the time to talk about this subject here on your internet site. It¡¦s really a great and helpful piece of info. I¡¦m happy that you just shared this helpful info with us. Please stay us up to date like this. Thanks for sharing. I like the valuable information you provide to your articles. I’ll bookmark your blog and check again here regularly. I’m moderately certain I will learn plenty of new stuff proper here! Good luck for the next! Hi, I do believe your web site might be having web browser compatibility problems. When I look at your website in Safari, it looks fine but when opening in IE, it’s got some overlapping issues. I just wanted to give you a quick heads up! Apart from that, excellent blog! Hiya, I’m really glad I have found this information. Today bloggers publish only about gossips and net and this is really annoying. A good website with interesting content, that is what I need. Thank you for keeping this web-site, I’ll be visiting it. Do you do newsletters? Can not find it. I wanted to post you this little observation to finally thank you so much the moment again for your personal precious ideas you’ve contributed here. It has been unbelievably generous with you to supply unreservedly what exactly numerous people would’ve sold as an ebook to help with making some dough on their own, precisely considering the fact that you might well have tried it in the event you wanted. Those inspiring ideas also acted like a fantastic way to realize that some people have the identical desire just as my very own to know great deal more related to this condition. I am sure there are millions of more fun situations in the future for people who read through your website. I precisely wished to say thanks yet again. I’m not certain the things that I might have used in the absence of the entire smart ideas discussed by you concerning my problem. This was an absolute frightening dilemma in my view, nevertheless being able to view a new skilled manner you processed the issue forced me to weep for gladness. I will be happier for your advice and thus believe you comprehend what a great job that you are accomplishing training the rest through the use of your web blog. I am sure you’ve never come across any of us. I¡¦ve been exploring for a little bit for any high quality articles or weblog posts in this kind of space . Exploring in Yahoo I eventually stumbled upon this site. Reading this info So i am satisfied to convey that I’ve a very excellent uncanny feeling I came upon just what I needed. I such a lot no doubt will make sure to do not put out of your mind this web site and provides it a glance on a relentless basis. I was just seeking this info for some time. After six hours of continuous Googleing, at last I got it in your site. I wonder what is the lack of Google strategy that don’t rank this type of informative web sites in top of the list. Generally the top websites are full of garbage. Hello! I’ve been reading your site for some time now and finally got the bravery to go ahead and give you a shout out from New Caney Tx! Just wanted to mention keep up the good job! Hi, I do believe this is an excellent website. I stumbledupon it 😉 I am going to come back yet again since i have book-marked it. Money and freedom is the greatest way to change, may you be rich and continue to help other people. Hello! I’ve been following your website for some time now and finally got the courage to go ahead and give you a shout out from Porter Tx! Just wanted to mention keep up the fantastic job! Generally I do not learn article on blogs, but I wish to say that this write-up very compelled me to try and do it! Your writing taste has been surprised me. Thank you, quite nice article. certainly like your web-site but you need to take a look at the spelling on quite a few of your posts. Many of them are rife with spelling problems and I in finding it very bothersome to inform the reality on the other hand I¡¦ll surely come again again. The info mentioned inside of the report are some of the most efficient accessible. Just beneath, are a whole lot of entirely not relevant net internet sites to ours, nevertheless, they could be certainly truly worth going more than. I don’t even understand how I finished up here, however I believed this post was good. I do not realize who you are however certainly you’re going to a well-known blogger in case you aren’t already. Cheers! Excellent post. I used to be checking constantly this weblog and I’m inspired! Extremely useful info specifically the final part 🙂 I handle such information a lot. I was looking for this particular info for a very long time. Thank you and best of luck. Good day! I could have sworn I’ve visited this website before but after browsing through a few of the articles I realized it’s new to me. Anyhow, I’m certainly happy I discovered it and I’ll be bookmarking it and checking back regularly! A person essentially lend a hand to make seriously articles I’d state. This is the very first time I frequented your website page and up to now? I amazed with the research you made to create this particular put up amazing. Wonderful process! Oh my goodness! Awesome article dude! Thank you so much, However I am encountering issues with your RSS. I don’t know why I am unable to subscribe to it. Is there anybody else getting similar RSS problems? Anybody who knows the answer can you kindly respond? Thanx!! I do not even know how I finished up here, but I thought this submit was once great. I do not realize who you are but definitely you’re going to a famous blogger in case you aren’t already. Cheers! Oh my goodness! Awesome article dude! Thanks, However I am going through problems with your RSS. I don’t understand the reason why I can’t subscribe to it. Is there anyone else having the same RSS problems? Anyone that knows the solution can you kindly respond? Thanks!! I don’t even understand how I ended up here, but I believed this publish used to be great. I don’t realize who you are but certainly you are going to a famous blogger for those who are not already. Cheers! You are so awesome! I don’t think I have read something like this before. So good to find someone with some unique thoughts on this issue. Really.. thank you for starting this up. This site is one thing that’s needed on the web, someone with some originality! Oh my goodness! Impressive article dude! Thanks, However I am experiencing problems with your RSS. I don’t know why I am unable to subscribe to it. Is there anybody else having the same RSS problems? Anyone that knows the solution will you kindly respond? Thanx!! I do not even know how I ended up right here, but I thought this put up was once great. I do not know who you might be however definitely you’re going to a well-known blogger in case you are not already. Cheers! My spouse and i have been ecstatic Albert could conclude his studies by way of the precious recommendations he acquired out of the site. It’s not at all simplistic to simply happen to be giving out strategies which usually the others may have been selling. So we grasp we need you to be grateful to because of that. These illustrations you made, the straightforward web site menu, the relationships your site aid to foster – it’s got everything remarkable, and it’s really letting our son and our family consider that the topic is brilliant, and that’s seriously serious. Thanks for all the pieces! Oh my goodness! Incredible article dude! Thanks, However I am experiencing problems with your RSS. I don’t know why I am unable to join it. Is there anybody getting the same RSS problems? Anybody who knows the answer can you kindly respond? Thanks!! I don’t even know how I finished up right here, but I believed this submit used to be good. I do not understand who you are but certainly you are going to a well-known blogger should you are not already. Cheers! I do not even know the way I stopped up right here, but I believed this put up used to be great. I do not recognize who you’re but definitely you’re going to a well-known blogger for those who are not already. Cheers! Oh my goodness! Awesome article dude! Thank you, However I am experiencing problems with your RSS. I don’t know the reason why I can’t join it. Is there anybody having the same RSS problems? Anybody who knows the answer will you kindly respond? Thanx!! Hey there! I realize this is sort of off-topic but I had to ask. Does operating a well-established website like yours take a large amount of work? I am brand new to writing a blog however I do write in my diary everyday. I’d like to start a blog so I will be able to share my personal experience and feelings online. Please let me know if you have any kind of suggestions or tips for new aspiring bloggers. Thankyou! Just want to say your article is as astounding. The clarity for your put up is simply cool and that i could suppose you’re an expert in this subject. Well with your permission allow me to grasp your RSS feed to stay updated with drawing close post. Thanks one million and please continue the rewarding work. Just want to say your article is as astonishing. The clearness on your submit is simply nice and that i can suppose you’re knowledgeable on this subject. Well along with your permission let me to seize your feed to stay up to date with approaching post. Thank you one million and please keep up the enjoyable work. I do not even know the way I stopped up right here, however I thought this post used to be great. I do not recognise who you are but definitely you are going to a famous blogger if you aren’t already. Cheers! Oh my goodness! Amazing article dude! Thank you so much, However I am going through issues with your RSS. I don’t know why I cannot join it. Is there anyone else getting the same RSS problems? Anyone that knows the solution will you kindly respond? Thanks!! Whats Taking place i’m new to this, I stumbled upon this I’ve found It positively useful and it has helped me out loads. I am hoping to give a contribution & aid other customers like its aided me. Great job. You can certainly see your expertise within the work you write. The world hopes for even more passionate writers such as you who aren’t afraid to say how they believe. All the time follow your heart. Its like you learn my thoughts! You appear to know a lot about this, such as you wrote the e-book in it or something. I feel that you just can do with some percent to pressure the message house a bit, but instead of that, this is excellent blog. A great read. I’ll definitely be back. I do not even understand how I ended up right here, however I thought this post was once great. I don’t know who you might be but certainly you’re going to a famous blogger for those who aren’t already. Cheers! Its like you read my mind! You appear to know a lot approximately this, like you wrote the ebook in it or something. I believe that you could do with a few p.c. to force the message house a bit, however instead of that, that is magnificent blog. A great read. I will definitely be back. Oh my goodness! Incredible article dude! Thanks, However I am having issues with your RSS. I don’t know why I can’t join it. Is there anyone else having identical RSS issues? Anybody who knows the solution will you kindly respond? Thanks!! Hi my friend! I wish to say that this post is amazing, great written and come with almost all important infos. I¡¦d like to see more posts like this . Hi would you mind letting me know which hosting company you’re working with? I’ve loaded your blog in 3 different web browsers and I must say this blog loads a lot faster then most. Can you recommend a good hosting provider at a honest price? Cheers, I appreciate it! Its like you learn my thoughts! You appear to know a lot about this, such as you wrote the ebook in it or something. I believe that you simply could do with a few to power the message house a little bit, but other than that, that is fantastic blog. A great read. I’ll certainly be back. Hi would you mind letting me know which webhost you’re working with? I’ve loaded your blog in 3 different internet browsers and I must say this blog loads a lot quicker then most. Can you recommend a good internet hosting provider at a reasonable price? Kudos, I appreciate it! Hi there would you mind letting me know which webhost you’re utilizing? I’ve loaded your blog in 3 completely different web browsers and I must say this blog loads a lot quicker then most. Can you suggest a good hosting provider at a honest price? Many thanks, I appreciate it! Oh my goodness! Impressive article dude! Many thanks, However I am experiencing issues with your RSS. I don’t understand the reason why I can’t join it. Is there anybody getting similar RSS issues? Anyone that knows the solution will you kindly respond? Thanx!! I do not even know the way I finished up right here, but I believed this publish used to be good. I do not recognize who you’re however definitely you are going to a famous blogger when you are not already. Cheers! Oh my goodness! Awesome article dude! Thank you so much, However I am experiencing issues with your RSS. I don’t know the reason why I can’t join it. Is there anyone else getting identical RSS issues? Anyone that knows the solution can you kindly respond? Thanks!! Oh my goodness! Amazing article dude! Thank you, However I am encountering troubles with your RSS. I don’t know why I cannot subscribe to it. Is there anybody having identical RSS issues? Anyone that knows the solution will you kindly respond? Thanks!! Appropriate now it seems like Movable Kind is the leading running a blog platform out there proper now. (from what I have study) Is that what you are utilizing on your website? I happen to be commenting to make you know of the fantastic experience our princess gained studying the blog. She even learned a lot of details, not to mention what it’s like to possess an awesome helping style to have many more with ease know a number of tortuous matters. You really did more than my expected results. Many thanks for presenting the beneficial, dependable, explanatory not to mention cool guidance on your topic to Tanya. Oh my goodness! Awesome article dude! Many thanks, However I am experiencing troubles with your RSS. I don’t know the reason why I am unable to join it. Is there anyone else having identical RSS issues? Anyone that knows the solution can you kindly respond? Thanks!! I don’t even know the way I ended up here, however I believed this post was once good. I do not realize who you might be but definitely you’re going to a famous blogger when you are not already. Cheers! What’s Happening i am new to this, I stumbled upon this I’ve discovered It positively useful and it has aided me out loads. I am hoping to give a contribution & assist different users like its aided me. Good job. Howdy! I just wish to give you a big thumbs up for the excellent info you have got right here on this post. I am returning to your website for more soon. Actually when somebody doesn’t be mindful of afterward its up to other viewers that they will support, so listed here it occurs. Howdy! I could have sworn I’ve been to this website before but after looking at many of the posts I realized it’s new to me. Regardless, I’m definitely happy I discovered it and I’ll be book-marking it and checking back frequently! When I at first commented I clicked the “Notify me when new feedback are added” checkbox and now every single time a remark is additional I get 3 email messages with the identical remark. Is there any way you can remove me from that support? Thank you! Hello! Someone in my Myspace group shared this site with us so I came to take a look. I’m definitely enjoying the information. I’m book-marking and will be tweeting this to my followers! Superb blog and outstanding design and style. Hi there colleagues, how is all, and what you want for to say about this post, in my check out its actually amazing created for me. I would like to thank you for the efforts you have put in writing this web site. I am hoping the same high-grade site post from you in the upcoming as well. In fact your creative writing skills has encouraged me to get my own web site now. Really the blogging is spreading its wings quickly. Your write up is a good example of it. Very handful of websites that happen to become in depth below, from our point of view are undoubtedly properly really worth checking out. Hey there would you mind stating which blog platform you’re using? I’m planning to start my own blog in the near future but I’m having a hard time choosing between BlogEngine/Wordpress/B2evolution and Drupal. The reason I ask is because your design seems different then most blogs and I’m looking for something unique. P.S Sorry for getting off-topic but I had to ask! Thank you for some other wonderful article. Exactly where else may possibly just anyone get that sort of details in this kind of an perfect indicates of creating? I’ve a presentation up coming 7 days, and I am on the lookup for such info. Appropriate now it seems to be like Movable Type is the best blogging system out there proper now. (from what I’ve read through) Is that what you are employing on your blog? Good ¡V I should definitely pronounce, impressed with your website. I had no trouble navigating through all the tabs as well as related information ended up being truly easy to do to access. I recently found what I hoped for before you know it at all. Quite unusual. Is likely to appreciate it for those who add forums or something, site theme . a tones way for your customer to communicate. Nice task.. It is going to be stop of mine working day, even so ahead of finish I am reading this superb post to boost my encounter. After exploring a number of the articles on your web site, I seriously like your technique of blogging. I added it to my bookmark site list and will be checking back soon. Take a look at my web site too and let me know your opinion. Rather! This has been a actually wonderful post. Many thanks for supplying this info. Hello! Someone in my Myspace group shared this site with us so I came to give it a look. I’m definitely loving the information. I’m bookmarking and will be tweeting this to my followers! Fantastic blog and terrific style and design. First off I want to say fantastic blog! I had a quick question that I’d like to ask if you don’t mind. I was interested to find out how you center yourself and clear your head before writing. I have had a tough time clearing my mind in getting my ideas out there. I do enjoy writing but it just seems like the first 10 to 15 minutes are lost simply just trying to figure out how to begin. Any suggestions or tips? Appreciate it! First off I would like to say excellent blog! I had a quick question in which I’d like to ask if you do not mind. I was curious to find out how you center yourself and clear your thoughts before writing. I have had a tough time clearing my mind in getting my thoughts out. I do take pleasure in writing however it just seems like the first 10 to 15 minutes are usually lost just trying to figure out how to begin. Any ideas or hints? Kudos! Sohan is also currently being accused of leaving the jurisdiction in December previous calendar year without authorization. Hey! Someone in my Myspace group shared this website with us so I came to look it over. I’m definitely loving the information. I’m book-marking and will be tweeting this to my followers! Superb blog and amazing design. Howdy! Someone in my Myspace group shared this website with us so I came to take a look. I’m definitely loving the information. I’m book-marking and will be tweeting this to my followers! Excellent blog and outstanding style and design. Hi there colleagues, how is all, and what you desire for to say about this put up, in my view its genuinely incredible designed for me. Just beneath, are a whole lot of absolutely not connected web sites to ours, nevertheless, they could be absolutely really value heading more than. Many thanks yet again for the blog put up.Genuinely thank you! Excellent. My husband and i ended up being so joyous when Jordan could round up his research because of the ideas he obtained in your web page. It is now and again perplexing to just continually be giving out ideas that many most people could have been selling. Therefore we grasp we now have the blog owner to give thanks to because of that. All of the illustrations you’ve made, the easy blog menu, the relationships you can make it easier to foster – it is mostly unbelievable, and it’s facilitating our son and us recognize that this theme is awesome, and that’s seriously indispensable. Thank you for everything! Very good way of explaining, and fastidious article to get data concerning my presentation matter make a difference, which i am heading to express in college. Hi there colleagues, how is all, and what you wish for to say about this submit, in my view its truly incredible created for me. Howdy! Someone in my Facebook group shared this website with us so I came to look it over. I’m definitely loving the information. I’m book-marking and will be tweeting this to my followers! Excellent blog and fantastic style and design. Thanks once again for the blog put up.Actually thank you! Great. One was designed only for showing seconds and little while a different one employing minute graduations is manufactured for implying several hours. Hey there! Someone in my Facebook group shared this website with us so I came to look it over. I’m definitely enjoying the information. I’m bookmarking and will be tweeting this to my followers! Exceptional blog and excellent design. Hey there! Someone in my Facebook group shared this website with us so I came to take a look. I’m definitely loving the information. I’m book-marking and will be tweeting this to my followers! Excellent blog and wonderful style and design. Genuinely when an individual does not be mindful of afterward its up to other viewers that they will help, so below it occurs. Hey there! I just lately observed your website and I certainly enjoy it. I enjoy to speak about omega xl from time to time. Very good to be about, thanks a lot! Thanks for one more useful world wide web site. The place else could I get that sort of data written in such an best technique?I have a enterprise that I’m just now running on, and I have been at the appear outfor such info. What’s up it is me, I am also browsing this web site on a typical basis, this internet site is really nice and the viewers are really sharing very good thoughts. The knowledge pointed out inside the report are some of the most powerful available. Hi! Someone in my Myspace group shared this website with us so I came to check it out. I’m definitely enjoying the information. I’m book-marking and will be tweeting this to my followers! Superb blog and superb style and design. Nice post. I was checking continuously this weblog and I am impressed! Very helpful info specially the final phase 🙂 I care for such information a lot. I was seeking this particular information for a very lengthy time. Thanks and best of luck. Hmm it seems like your website ate my first comment (it was super long) so I guess I’ll just sum it up what I had written and say, I’m thoroughly enjoying your blog. I as well am an aspiring blog writer but I’m still new to the whole thing. Do you have any suggestions for novice blog writers? I’d genuinely appreciate it. Hey there! I lately observed your website and I definitely take pleasure in it. I love to communicate about omega xl sometimes. Good to be around, thanks a good deal! Hey there! I lately saw your internet site and I certainly get pleasure from it. I enjoy to talk about omega xl at times. Great to be around, thanks a lot! Great post! We will be linking to this great post on our internet site. Keep up the very good creating. Nice post. I used to be checking continuously this weblog and I’m impressed! Extremely useful information specifically the closing section 🙂 I maintain such info much. I was looking for this particular information for a long time. Thanks and good luck. fantastic put up, very informative. I’m wondering why the opposite specialists of this sector don’t understand this. You should proceed your writing. I’m confident, you have a great readers’ base already! Hmm it seems like your blog ate my first comment (it was super long) so I guess I’ll just sum it up what I submitted and say, I’m thoroughly enjoying your blog. I as well am an aspiring blog writer but I’m still new to everything. Do you have any tips and hints for newbie blog writers? I’d genuinely appreciate it. Excellent post. I used to be checking constantly this weblog and I am inspired! Very helpful info specially the last phase 🙂 I take care of such information much. I was seeking this particular info for a long time. Thank you and good luck. Excellent post. I was checking continuously this blog and I am impressed! Extremely helpful information particularly the last phase 🙂 I care for such info a lot. I was seeking this certain information for a very long time. Thank you and good luck. Hey! Someone in my Facebook group shared this website with us so I came to give it a look. I’m definitely loving the information. I’m book-marking and will be tweeting this to my followers! Great blog and excellent design. Hmm it appears like your website ate my first comment (it was super long) so I guess I’ll just sum it up what I had written and say, I’m thoroughly enjoying your blog. I as well am an aspiring blog blogger but I’m still new to everything. Do you have any tips for newbie blog writers? I’d certainly appreciate it. Hey! Someone in my Facebook group shared this site with us so I came to check it out. I’m definitely enjoying the information. I’m bookmarking and will be tweeting this to my followers! Fantastic blog and excellent design and style. Sohan is also being accused of leaving the jurisdiction in December final year without having permission. Many thanks once more for the site put up.Truly thank you! Fantastic. Howdy! Someone in my Myspace group shared this website with us so I came to give it a look. I’m definitely enjoying the information. I’m book-marking and will be tweeting this to my followers! Superb blog and terrific design. The data mentioned inside the report are some of the most successful obtainable. Hey! Someone in my Myspace group shared this site with us so I came to look it over. I’m definitely enjoying the information. I’m bookmarking and will be tweeting this to my followers! Outstanding blog and superb design. A single was created only for showing seconds and modest while a different a single utilizing moment graduations is made for implying hrs. Great way of detailing, and fastidious post to get info about my presentation subject matter subject, which i am heading to convey in faculty. Right now it seems like Movable Kind is the top running a blog platform out there proper now. (from what I have go through) Is that what you are making use of on your site? Hi there! Someone in my Facebook group shared this website with us so I came to look it over. I’m definitely loving the information. I’m bookmarking and will be tweeting this to my followers! Excellent blog and outstanding style and design. Hi! Someone in my Facebook group shared this website with us so I came to give it a look. I’m definitely loving the information. I’m book-marking and will be tweeting this to my followers! Great blog and terrific design. One particular was produced only for demonstrating seconds and little even though a distinct a single making use of moment graduations is produced for implying hrs. With respect to ergonomics and the advanced technilogy Heuer reproduction watches have been the fantastic samples of sports watches. The information talked about inside of the report are some of the most successful available. Hello there! I know this is kinda off topic but I’d figured I’d ask. Would you be interested in trading links or maybe guest writing a blog post or vice-versa? My blog goes over a lot of the same subjects as yours and I feel we could greatly benefit from each other. If you might be interested feel free to shoot me an e-mail. I look forward to hearing from you! Superb blog by the way! Hey there! I know this is kinda off topic nevertheless I’d figured I’d ask. Would you be interested in exchanging links or maybe guest writing a blog post or vice-versa? My site addresses a lot of the same subjects as yours and I feel we could greatly benefit from each other. If you might be interested feel free to shoot me an e-mail. I look forward to hearing from you! Great blog by the way! Hello! Someone in my Facebook group shared this website with us so I came to look it over. I’m definitely loving the information. I’m bookmarking and will be tweeting this to my followers! Terrific blog and great design. Do you have a spam problem on this blog I also am a blogger, and I was wanting to know your predicament we have created some good methods and we are seeking to swap approaches with other folks, be certain to shoot me an e mail if intrigued. Hi! Someone in my Myspace group shared this website with us so I came to give it a look. I’m definitely loving the information. I’m book-marking and will be tweeting this to my followers! Fantastic blog and excellent style and design. whoah this weblog is great i love reading your articles. Keep up the good work! You know, many persons are hunting round for this info, you can aid them greatly. Just beneath, are a good deal of entirely not related web web sites to ours, even so, they might be certainly genuinely value heading over. Verify under, are some totally unrelated web-websites to ours, however, they are most trustworthy resources that we use. Hi there colleagues, how is all, and what you wish for to say about this put up, in my view its truly incredible developed for me. It’s likely to be conclude of mine day, even so ahead of end I am reading this wonderful submit to increase my expertise. I was excited to find this site. I wanted to thank you for your time just for this wonderful read!! I definitely really liked every bit of it and i also have you bookmarked to look at new things in your blog. You actually make it appear so easy together with your presentation however I find this topic to be actually something that I think I might never understand. It sort of feels too complicated and very huge for me. I’m taking a look ahead to your subsequent post, I’ll attempt to get the hold of it! Do you have a spam issue on this site I also am a blogger, and I was wanting to know your scenario we have developed some great methods and we are seeking to swap techniques with other folks, be sure to shoot me an electronic mail if intrigued. Appropriate now it appears like Movable Kind is the top blogging platform out there proper now. (from what I have read through) Is that what you are using on your weblog? I’m pretty pleased to discover this great site. I wanted to thank you for your time for this fantastic read!! I definitely savored every little bit of it and i also have you book-marked to see new stuff in your site. You really make it appear so easy together with your presentation however I find this topic to be actually something which I believe I’d by no means understand. It kind of feels too complicated and very extensive for me. I am taking a look ahead on your next put up, I will try to get the hang of it! Rather! This has been a really superb report. Many thanks for providing this data. Hi there colleagues, how is all, and what you want for to say about this put up, in my view its really wonderful made for me. Hi! Someone in my Facebook group shared this site with us so I came to check it out. I’m definitely enjoying the information. I’m bookmarking and will be tweeting this to my followers! Terrific blog and wonderful design. Great publish! We will be linking to this fantastic post on our site. Preserve up the excellent producing. You actually make it seem really easy with your presentation but I in finding this topic to be really one thing that I feel I might never understand. It sort of feels too complicated and very huge for me. I am looking forward for your next publish, I will try to get the dangle of it! Hi there! Someone in my Facebook group shared this site with us so I came to check it out. I’m definitely enjoying the information. I’m book-marking and will be tweeting this to my followers! Wonderful blog and brilliant design. You actually make it seem so easy along with your presentation however I find this topic to be actually one thing that I believe I might by no means understand. It seems too complicated and extremely extensive for me. I am looking forward for your next put up, I will try to get the dangle of it! A single was designed only for exhibiting seconds and tiny while a various one particular using moment graduations is produced for implying several hours. Hi there! Do you know if they make any plugins to support with Search engine marketing? I’m striving to get my site to rank for some targeted keywords but I’m not seeing really great gains. If you know of any please share. Numerous many thanks! It’s likely to be stop of mine working day, nonetheless just before finish I am studying this fantastic submit to enhance my experience. Hey there! I not too long ago observed your internet site and I definitely take pleasure in it. I love to speak about omega xl from time to time. Good to be around, thanks a lot! What’s up it is me, I am also browsing this internet site on a typical foundation, this internet site is really pleasurable and the viewers are really sharing very good thoughts. One particular was designed only for exhibiting seconds and small although a diverse a single making use of minute graduations is created for implying hours. Thanks for the marvelous posting! I definitely enjoyed reading it, you might be a great author. I will remember to bookmark your blog and will come back down the road. I want to encourage you to definitely continue your great posts, have a nice day! Thanks for one’s marvelous posting! I genuinely enjoyed reading it, you might be a great author. I will ensure that I bookmark your blog and will eventually come back later in life. I want to encourage one to continue your great posts, have a nice weekend! I’ve been browsing on-line more than 3 hours nowadays, but I by no means found any fascinating article like yours. It’s lovely price enough for me. Personally, if all webmasters and bloggers made good content material as you did, the web might be much more helpful than ever before. My developer is trying to persuade me to move to .net from PHP. I have always disliked the idea because of the costs. But he’s tryiong none the less. I’ve been using WordPress on a number of websites for about a year and am nervous about switching to another platform. I have heard great things about blogengine.net. Is there a way I can transfer all my wordpress content into it? Any help would be greatly appreciated! Hi there! This blog post could not be written any better! Reading through this post reminds me of my previous roommate! He always kept preaching about this. I most certainly will forward this information to him. Pretty sure he will have a great read. Thank you for sharing! Hello there! This article could not be written any better! Looking at this article reminds me of my previous roommate! He always kept preaching about this. I most certainly will forward this article to him. Pretty sure he’s going to have a very good read. Many thanks for sharing! My programmer is trying to convince me to move to .net from PHP. I have always disliked the idea because of the costs. But he’s tryiong none the less. I’ve been using WordPress on several websites for about a year and am concerned about switching to another platform. I have heard very good things about blogengine.net. Is there a way I can import all my wordpress content into it? Any kind of help would be really appreciated! Hi there! This post could not be written much better! Reading through this article reminds me of my previous roommate! He always kept talking about this. I am going to forward this article to him. Fairly certain he will have a very good read. Many thanks for sharing! Hello there! This article could not be written much better! Going through this post reminds me of my previous roommate! He continually kept preaching about this. I’ll send this article to him. Pretty sure he will have a very good read. Thank you for sharing! Very good way of outlining, and fastidious report to get information concerning my presentation topic make a difference, which i am likely to convey in faculty. Really when someone does not be aware of afterward its up to other viewers that they will help, so listed here it happens. First of all I would like to say excellent blog! I had a quick question that I’d like to ask if you don’t mind. I was curious to find out how you center yourself and clear your head prior to writing. I have had trouble clearing my thoughts in getting my thoughts out. I do enjoy writing however it just seems like the first 10 to 15 minutes are usually lost simply just trying to figure out how to begin. Any ideas or tips? Thanks! After going over a few of the blog posts on your web site, I really appreciate your way of blogging. I bookmarked it to my bookmark site list and will be checking back soon. Please visit my web site too and tell me how you feel. After looking into a number of the blog articles on your blog, I seriously like your technique of writing a blog. I book-marked it to my bookmark website list and will be checking back soon. Please check out my web site as well and tell me what you think. First of all I want to say wonderful blog! I had a quick question in which I’d like to ask if you don’t mind. I was curious to find out how you center yourself and clear your head prior to writing. I’ve had trouble clearing my thoughts in getting my thoughts out. I do enjoy writing however it just seems like the first 10 to 15 minutes are wasted just trying to figure out how to begin. Any recommendations or tips? Appreciate it! I don’t want to tell you how to run your blog, but what if you added a post title that grabbed folk’s attention? I mean BLOG_TITLE is a little plain. You should glance at Yahoo’s home page and note how they write post headlines to get viewers interested. You might add a video or a pic or two to grab readers interested about what you’ve got to say. Just my opinion, it could bring your posts a little livelier. Magnificent goods from you, man. I have understand your stuff previous to and you are simply extremely fantastic. I really like what you have got right here, really like what you are stating and the way in which in which you assert it. You are making it entertaining and you still take care of to keep it sensible. I can’t wait to learn far more from you. This is really a wonderful site. hello there and thank you for your information – I have certainly picked up something new from right here. I did however expertise several technical issues using this site, since I experienced to reload the site a lot of times previous to I could get it to load properly. I had been wondering if your hosting is OK? Not that I’m complaining, but slow loading instances times will sometimes affect your placement in google and can damage your quality score if ads and marketing with Adwords. Anyway I am adding this RSS to my e-mail and could look out for a lot more of your respective exciting content. Make sure you update this again soon. Magnificent goods from you, man. I’ve take into accout your stuff prior to and you’re just extremely great. I really like what you’ve obtained here, certainly like what you are saying and the way by which you assert it. You are making it entertaining and you still care for to keep it wise. I cant wait to learn much more from you. This is actually a wonderful web site. hey there and thank you for your information – I have definitely picked up something new from right here. I did however expertise some technical issues using this site, as I experienced to reload the site lots of times previous to I could get it to load correctly. I had been wondering if your hosting is OK? Not that I’m complaining, but slow loading instances times will often affect your placement in google and could damage your high quality score if advertising and marketing with Adwords. Well I am adding this RSS to my email and can look out for much more of your respective fascinating content. Make sure you update this again soon. Correct now it seems to be like Movable Kind is the prime running a blog platform out there correct now. (from what I’ve read) Is that what you are using on your weblog? Its such as you learn my thoughts! You appear to understand so much approximately this, such as you wrote the guide in it or something. I feel that you simply can do with a few to pressure the message home a little bit, but other than that, this is fantastic blog. An excellent read. I’ll definitely be back. Right now it looks like Movable Variety is the best running a blog platform out there proper now. (from what I’ve read through) Is that what you are employing on your blog? Pretty! This has been a actually superb report. Thanks for offering this details. It’s perfect time to make some plans for the long run and it is time to be happy. I’ve learn this post and if I may I wish to suggest you some attention-grabbing issues or tips. Perhaps you could write subsequent articles relating to this article. I want to learn even more things about it! Its like you learn my thoughts! You seem to understand so much about this, such as you wrote the guide in it or something. I think that you could do with a few p.c. to force the message house a bit, but instead of that, that is great blog. A great read. I will certainly be back. Its such as you learn my thoughts! You seem to understand so much approximately this, such as you wrote the ebook in it or something. I think that you just can do with a few p.c. to pressure the message house a bit, however instead of that, that is great blog. A great read. I will definitely be back. hello!,I really like your writing so a lot! proportion we keep up a correspondence extra approximately your post on AOL? I require a specialist on this area to solve my problem. May be that is you! Looking ahead to see you. hello!,I love your writing very a lot! proportion we keep in touch more approximately your article on AOL? I need an expert in this space to unravel my problem. Maybe that’s you! Looking ahead to look you. Hey there! Someone in my Facebook group shared this website with us so I came to take a look. I’m definitely loving the information. I’m bookmarking and will be tweeting this to my followers! Excellent blog and superb design. Hey there! Someone in my Myspace group shared this site with us so I came to look it over. I’m definitely loving the information. I’m bookmarking and will be tweeting this to my followers! Superb blog and amazing design and style. You really make it seem really easy together with your presentation however I find this topic to be really something that I feel I might by no means understand. It kind of feels too complex and very extensive for me. I’m taking a look ahead to your subsequent submit, I’ll try to get the dangle of it! Hello! Someone in my Facebook group shared this website with us so I came to give it a look. I’m definitely enjoying the information. I’m book-marking and will be tweeting this to my followers! Terrific blog and excellent design and style. Hey! Someone in my Myspace group shared this site with us so I came to check it out. I’m definitely enjoying the information. I’m bookmarking and will be tweeting this to my followers! Terrific blog and terrific design.